Createspace Independent Publishing Platform, 9781475194517, 376pp. While investigating the murder of a Marine veteran at a motorcycle rally, reporter Ben Teller infiltrates the Mormon Temple and uncovers a dark secret that could determine the U.S. presidential elections. Initial Readers' Reviews on Amazon.com: 5.0 out of 5 stars Great Political Thriller, July 23, 2012 By T.J. D "TJ" (IN United States) The Mormon Candidate by Avraham Azrieli is a fast-paced political thriller that will have you wanting to turn the page until the very end. The book takes readers past politics and into the world of the Mormon Church. It is an eye-opening discovery of just what the church is about and why they choose to stay so secretive. While many political thrillers tend to rehash the same clich's, this book goes beyond a typical political thriller to provide the reader with a new angle. The Mormon Candidate is well written, and more importantly, well researched to present a realistic picture of the Mormon Church. I would recommend this book to anyone who loves political thrillers, but also to those who just love to read a good story. 5.0 out of 5 stars Unexpectedly Good, July 22, 2012 By heap I have to admit, I didn't think I'd enjoy this book; I practically knew nothing about Mormons, and all the books I've read on the same genre usually involve the Catholic Church. However, "The Mormon Candidate" was a surprisingly fresh and exciting take on politics and religion; I just had to finish it right away. Fluid and always interesting, this book just reeled me in with its unexpected twists, drama, and characters who are described so vividly I could imagine them next to me. 5.0 out of 5 stars Keeps Your Fingers Crossed Till The End, July 21, 2012 By Jude Hickmann It's been long time that I felt fully satisfied after reading a book. I should appreciate the way Avraham unfolds the mystery behind the motorcycle accident, the book is adventurous, and no dip in excitement. I basically have great interest in stories that speak about politics and Avraham exactly triggered this excitement in me. I would feel that all readers, after reading this book, would have experienced the same kind of feeling I had. I would again start reading this book and am sure even if we read multiple times, it will bring the same excitement as in the beginning. Avraham Azrieli had become one of my favorite authors. 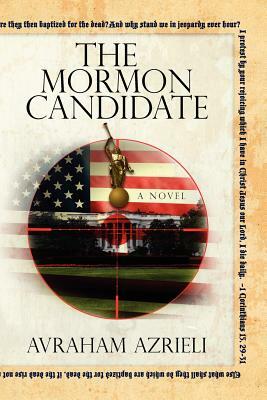 4.0 out of 5 stars Politically Relevant Action, July 20, 2012 By Mitch Wyatt "The Mormon Candidate" is a rare book in that it manages to be both highly entertaining and highly relevant to the current political climate. Ben Teller's unyielding investigation of a suspicious accidental motorcycle death enhances the excitement of the overall story. Azrieli has done a staggering amount of research to make the facts of the book as accurate as possible. All of the scriptures listed, and the descriptions of individual aspects of the church are essentially dead-on. Considering the parallels of the book to real life, absolutely anyone who has any interest in politics or the Mormon Church will quickly find themselves taken away by this interesting story ]. 5.0 out of 5 stars Dan Brown and James Patterson Collide, July 19, 2012 By Penny Brien (Higley, AZ United States) What an amazing story this is. It is the DaVinci Code of the Mormon Church with the James Patterson flair for adventure and mysterious twists. Don't start reading this book unless you have the time to finish it because once you start reading you won't be able to put it down. It enthralls you from the first page and sends you on a roller coaster of adventure. Ben Teller is a tenacious reporter who will just not let go of this story until he has all the answers and the twists and turns have the reader curious to know all the answers as well. Wonderfully well written and worth every bit of time expended in reading it. I would recommend this book to any one who enjoys authors such as Dan Brown, David Baldacci and James Patterson; because Avraham Azrieli is in their lea.